Germany, France and Italy has announced that they would follow Britain and join the Chinese-led Asian Infrastructure Investment Bank. With joining of these countries, the total number of the bank's member states including India has gone up to 30. The AIIB is one of a number of new institutions launched by China, apparently in frustration at the failure of the existing international order to accommodate its speedy rise. In recent past efforts to reform the International Monetary Fund (IMF) are stalled in the American Congress. America retains its traditional grip on the management of the World Bank. 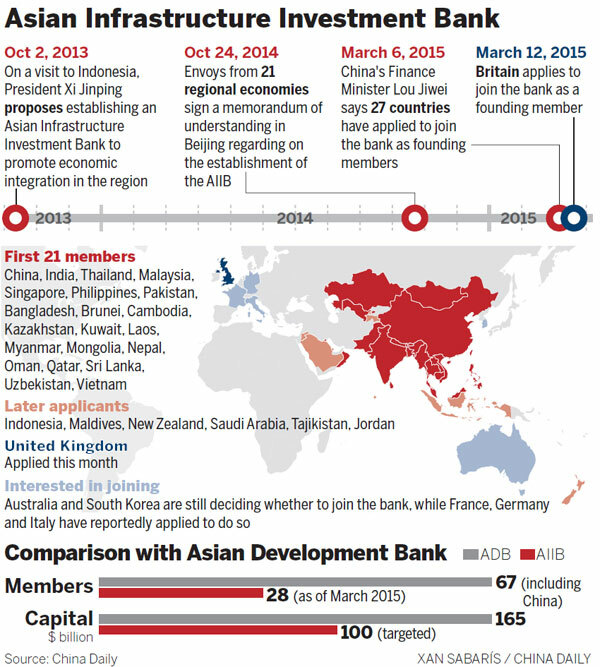 The Asian Development Bank remains based in Manila but directed by a succession of Japanese bureaucrats. China has proposed not just the AIIB, but also a New Development Bank launched with its “BRICS” partners—Brazil, Russia, India and South Africa—and a Silk Road development fund to boost “connectivity” with its Central Asian neighbours. All respond to the need for massive investment in infrastructure to support development. The Asian Infrastructure Investment Bank (AIIB) is an international financial institution proposed by China. The purpose of the multilateral development bank is to provide finance to infrastructure projects in the Asia-Pacific region. AIIB is regarded by some as a rival for the IMF, the World Bank and the Asian Development Bank (ADB),which are regarded as dominated by developed countries like the United States.